Timeline of North Korean Missiles “Failures” since April of 2017 when Recent Tensions began to Flare with the U.S. Editors Note UPDATE 8/30/17 : Once again four North Korean missiles have “failed” in a row as the U.S. and South Korea conduct joint exercises this week. The first volley of missiles to “fail” included 3 intermediate range missiles with one blowing up just miles above the launch pad. The others blowing up consecutively minutes apart in the boost phase of the launch window. This once again fits the profile of an airborne laser system attack. The U.S. Pacific Command said in a statement that three North Korean short-range missiles failed — two after flying an unspecified distance and another seemingly blowing up almost immediately. It added that the missile posed no threat to the U.S. territory of Guam, which the North had previously warned it would fire missiles toward. Soon after on 8/28/17 it was reported that another missile launch over Japan fell into the ocean in 3 pieces. Very interesting. The United States may be shooting down these missiles and denying it. As to not start a full scale war on the Korean Peninsula. This all stated back in April with a string of mysterious “missile failures” by North Korea that fit the profile of covert missile interceptions. It’s an update on 4-28-17 Oops! Looks like North Korea just had another “missile failure” right after launch. This makes four missiles in a row possibly intercepted in the boost phase of launch by an Air Bourne Laser System. Very revealing that this is a truck launched missile that failed called the KN-17. Almost assuredly not hooked to any type of internet. What little internet there is in North Korea. So the “hacking is bringing missiles down story” given by the main stream media falls apart. This is the fourth missile to go down of differing varieties in the boost phase over the last month. The fourth missile to go down in the last month. Very interesting up until last month North Korea was launching four missiles at the same time flawlessly for years. One would only hope if the Air Bourne Laser System was operational it would be used. Providing plausible deniability to the U.S. an it’s allies in the region. Stopping short of all out war on the Korean Peninsula. Heightening tensions in the stand off between the United States and North Korea almost reached a boiling point over the Easter weekend of 2017. North Korea celebrated it’s national holiday called “The Day of the Sun” and was expected to detonate an underground nuclear bomb test and launch missiles. Much to the relief of people around the world cooler heads prevailed. The North Korean regime blinked for the first time and did not conduct a sixth nuclear bomb test. The United States has said if North Korea tested a nuclear device a massive strike would follow. However the North Korean military did conduct a test of a new Intercontinental Ballistic Missile. That missile is said to have failed right after launch in the boost phase of it’s flight path. The U.S. also stated if North Korea launched a missile it would be shot down. Did the missile fail on it’s own or was it taken down by the United States using an airborne laser system? US Pacific Command detected and tracked what we assess was a North Korean missile launch at 11:21 am Hawaii time (2121 GMT) April 15. The missile was tracked meaning it got off the ground and did not blow up on the pad. It was destroyed in the boost phase of the launch. American officials have been very quiet on the whole matter. Some have speculated that the United States may have planted some malware into the North Korean missile system computers to sabotage the launch. It is possible just as the CIA injected Stuxnet into Iranian Nuclear faculties to cripple their computer systems. This would be difficult as North Korea’s missile program is not hooked to the internet. Just as most of North Korea does not have internet or even electric most of the time. Getting an agent inside North Korea’s missile program to physically implant the malware is an even more dubious assumption. The regime routinely kills anyone suspected of even having a cell phone. Getting an agent of the United States close enough to the missile command and control systems of the “Hermit Kingdom” would be next to impossible. Even for James Bond. A much more likely scenario is that it was shot out of the air in the boost part of it’s trajectory by an Airborne Laser System or Seaborne Laser System. 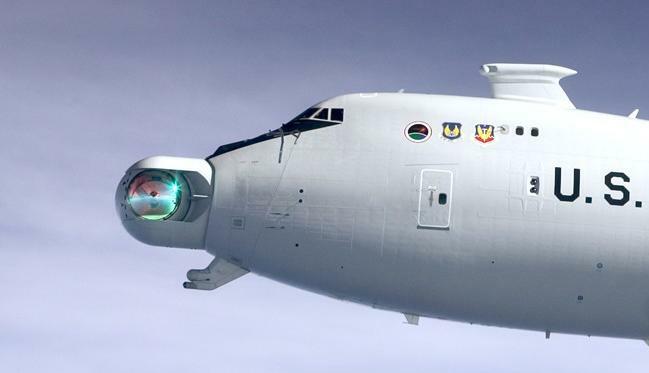 The Boeing YAL-1 Airborne Laser Test 747 used a chemical oxygen iodine laser (COIL) that took up the entire body of the modified Boeing 747 fuselage. A kilowatt class laser it used a primary targeting laser to track it’s target and test the atmosphere before firing of the main laser. Using adaptive optics, a technique used by astronomers, it adjusts the laser to negate the effects of atmospheric distortions. Having the business end of the system shooting a high powered laser out the nose of the aircraft. Capable of hitting targets many 100s of miles away by directing a powerful laser to side of the missile causing it to heat up and explode. Used to destroy missiles in the boost phase of flight with enough power for 20 shots. This weapon system was first tested back in 2004. The Boeing YAL-1 had many successful tests, even engaging to two missiles in the boost phase in one experiment, until it’s retirement in 2011. Hitting a enemy missile in the boost portion of it’s launch would allow any nuclear payload to remain the problem of the country who launched it. Also it makes room for some plausible deniability as rockets blow up all the time and it would be hard to pin the action on a nation fielding this technology. Retirement for the Boeing YAL-1 means it was just a prototype and lessons learned would be applied to future airborne laser systems. The technology developed in this demonstrator would later be applied to drone aircraft. The United States government has experimented publically with these air borne laser systems for many decades. Laser technology has improved rapidly since that time. No longer using chemical lasers. Most systems now employ a solid state laser that is much smaller and more powerful. The YAL-1 airborne laser generated a kilowatt of laser power per 55 kilograms of weight. New solid state airborne lasers can field a kilowatt of power per 35 kilograms and do not need to store heavy chemical on board. Allowing a much smaller air frame to carry the system. Possibly using stealth drone aircraft such as the RQ-180 that has increased loiter time and cannot be seen on radar. Able to stay over enemy countries undetected for long periods of time with no risk to a human pilot. The solid state laser takes it’s power from the aircraft engines. An unlimited magazine of ammo as long as it can be refueled in mid air. The military is even employing ground laser systems as well as AC-130 cargo planes to deliver deadly laser strikes and non lethal pain rays for crowd control. Laser weapons are also being tested for use on fighter aircraft. Directed energy microwave rifles are being employed by security agencies right now to take down errant drones that may threaten the super bowl of other large events. Why not use this proven technology to protect millions of lives? These type of weapons are most likely being used to take down missiles in the boost phase. The world may have just seen a demonstration. 3 Comments on North Korean Missile Test Shot Down by an Airborne Laser System? The string of North Korean missile failures started back in 2014. Actually, they’ve had more successful launches over the past year (2017). 2014-2015 were the years with highest failure rates.